Zoom in on a carrier pigeon, now preserved and displayed in a museum, that was responsible for saving many lives in the First World War. Find out about the Dicken Medal which has been awarded to 32 pigeons, 28 dogs, 3 horses and 1 cat since 1943. Read about animals that help troops in conflicts today. Inspiring tales of the often heroic roles animals have played in modern and ancient wars. The Usborne Reading Programme has been developed with reading experts from Roehampton University. Young Reading Series 3 is designed to provide more complex stories for confident readers. From Hannibal’s elephants to World War One carrier pigeons and parachuting dogs in World War Two, children can discover how extraordinary animals have shaped the course of conflicts across the centuries. Published in association with the Imperial War Museum, this is one title from Usborne's Young Reading series. From horses and elephants carrying armies to dogs parachuting from planes and dolphins detecting mines, animals have played part in some of the bloodiest battles in history. Their stories are compelling and as tragic as those of the soldiers they served. This title is from Series 3 of the Usborne Young Reading programme and is intended for independent readers who want to tackle longer texts. 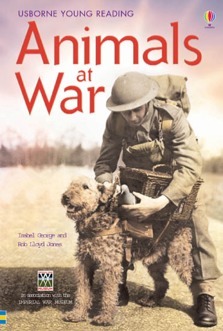 Chapters include: animal heroes, war horses, battle in the skies, a soldier's best friend and mascots. A useful book to support a KS2 History topic on either of the World Wars.